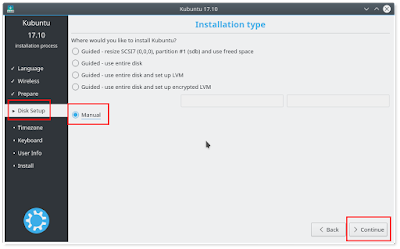 This is a beginner's guide to install Kubuntu 17.10 "Artful Aardvark". 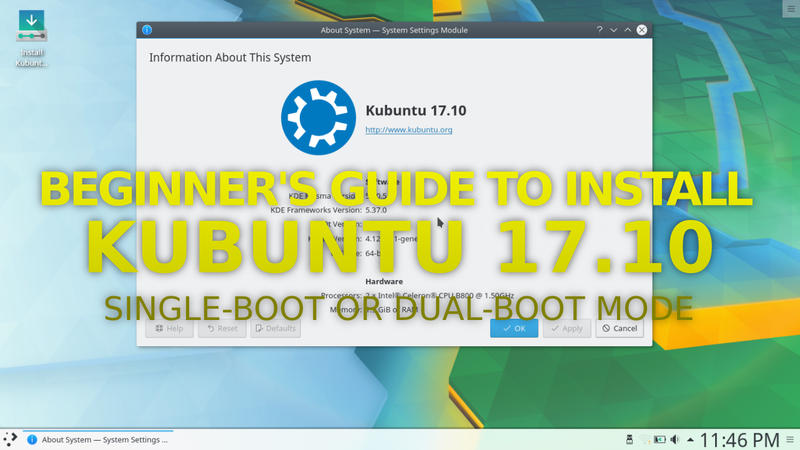 If you are first-timer in Kubuntu or even new comer in GNU/Linux OS family, this guide is for you. What you will do here: you will prepare two partitions first, then make a bootable USB media (similar to DVD for OS installation), then performing through 10 steps to install Kubuntu. The rest of installation takes only +/-20 minutes (yes, including all drivers needed) and overall it's magically easy. 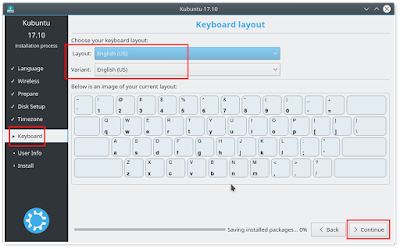 You can use this guide to install Kubuntu either in single-boot or dual-boot mode. 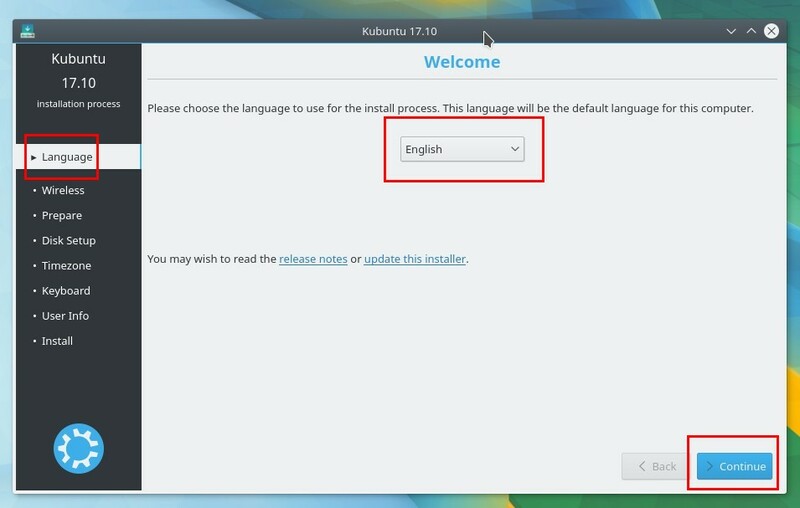 Read carefully and be happy with Kubuntu 17.10! This article is an installation guide. 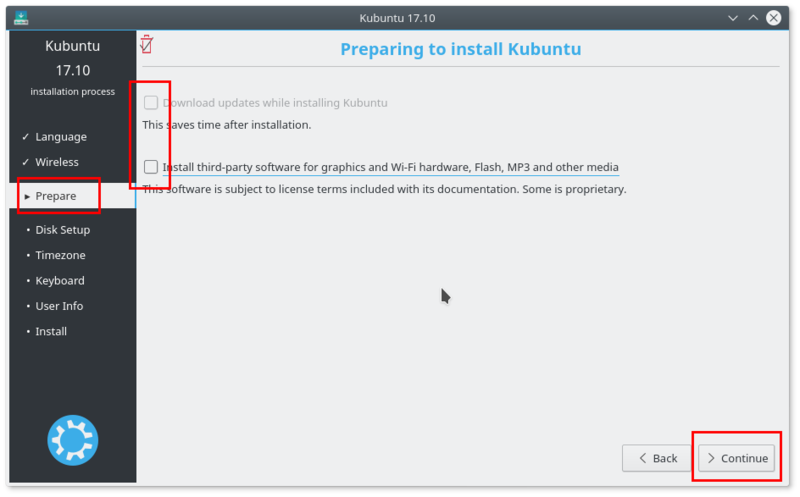 If you need something else, read Recommendations To Do After Installing Kubuntu 17.10. WARNING: if your computer is not empty (e.g. already having MS Windows pre-installed): DO NOT PERFORM ANY PARTITIONING BY YOURSELF UNLESS YOU ASKED SOMEBODY EXPERIENCED TO GUIDE YOU IN-PLACE AND HAVE MADE DATA BACKUP. 1) Download Kubuntu 17.10: see complete 17.10 direct-download links here. 2) Make bootable media of Kubuntu: write Kubuntu ISO image to a USB flash disk with capacity of >=4GB. You can use free Unetbootin program because it's available for MS Windows, Mac OS X, and GNU/Linux. Unetbootin is free software. 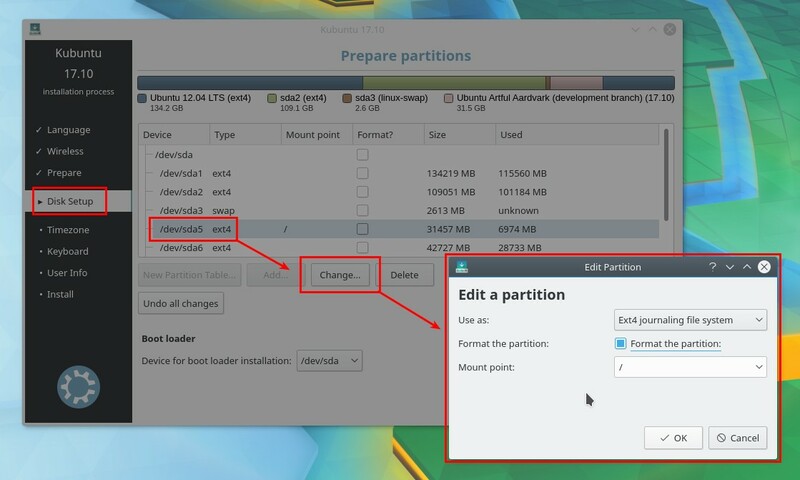 3) Create 2 blank partitions: first partition >=20GB for main partition, second partition 1GB for swap partition. You can use free GParted program to do it. Example: I prepared my first partition /dev/sda5 30GB [main partition] and second partition /dev/sda3 2.5GB [swap partition] and I will install the bootloader at /dev/sda. Make sure you have stable electricity input (no battery low, no blackout) so your installation won't be broken. Plug your Kubuntu USB drive in and boot up your computer to USB. There you should see Kubuntu screen showing with animation and bluish effect. 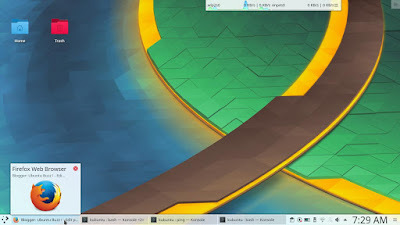 Finally you enter the Kubuntu live session desktop and choose 'Try Kubuntu' there. 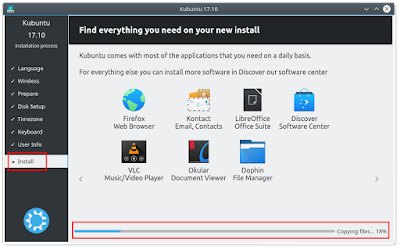 Run the icon 'Install Kubuntu' to start installing. First step: choose your language. This will be the language of the whole of desktop and apps. Second step: choose "I don't want to connect ...". This makes the installation doesn't need internet connection and will finish faster. Third step: choose nothing a.k.a. blank all choice. This makes you don't download anything from the internet while installing (and installation goes quicker). Fourth step: choose "Manual". Always use and believe Manual choice, don't believe any Automatic one. Don't use the "Guided ..." (a.k.a. "Automatic ...") unless your computer has no another OSes installed. 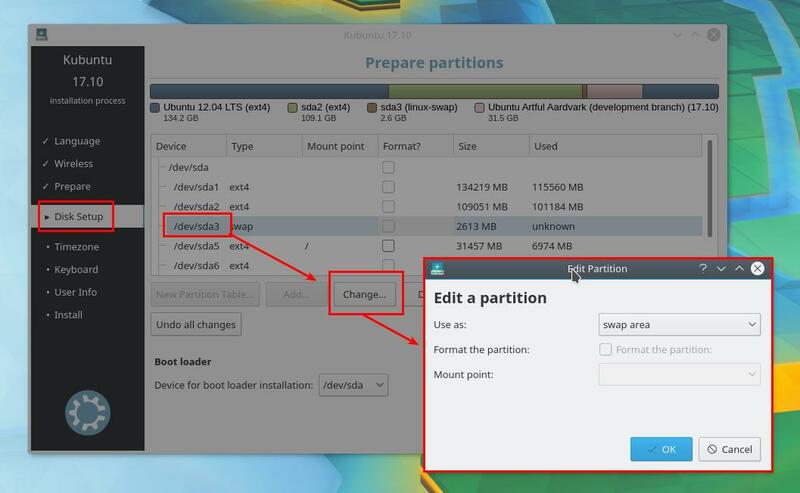 Fifth step: click your first blank partition > click 'Change' > you see 'Edit A Partition' dialog > set Use as: Ext4 journaling file system > set Format the partition: yes/check it out > set Mount point: / > click OK.
Sixth step: choose your second blank partition > click 'Change' > you see 'Edit A Partition' dialog > set Use as: swap area > set Format the partition: yes/check it out > click OK. Seventh step: choose where the bootloader should be installed. If your main partition is /dev/sda5, then the location is /dev/sda. Or if your main is /dev/sdb5, the location is /dev/sdb. Notice that the letter-suffixed (sda, sdb) is your hard disk, and the number-suffixed (sda5, sdb5) is partition inside that hard disk. Eigth step: press 'Install Now' button. Before pressing this, make sure all your choices are correct and you leave no mistake. Please recheck and make sure first. When you asked "Write the changes to disks?" 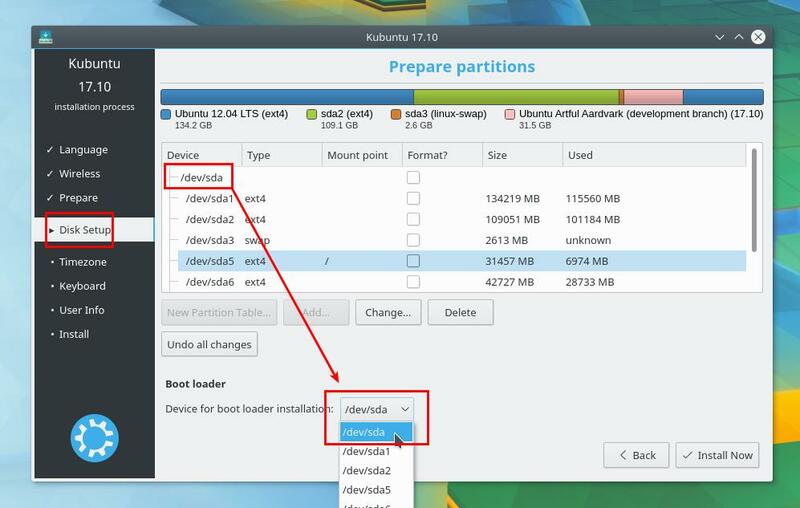 you should read the partitions going to be formatted, make sure all are correct, read three times to make sure. After that, press 'Continue'. You cannot go back after pressing Continue! Ninth step: determine 3 user info: geolocation, keyboard setup, and username/password. 1) Geolocation: choose location where you live. This makes Kubuntu system to set your date/time zone, your measurement system and formats (such as km/mile, kg/pound, m/feet), your currency, all correctly. 2) Keyboard Setup: choose your keyboard layout. The default choice is safe. 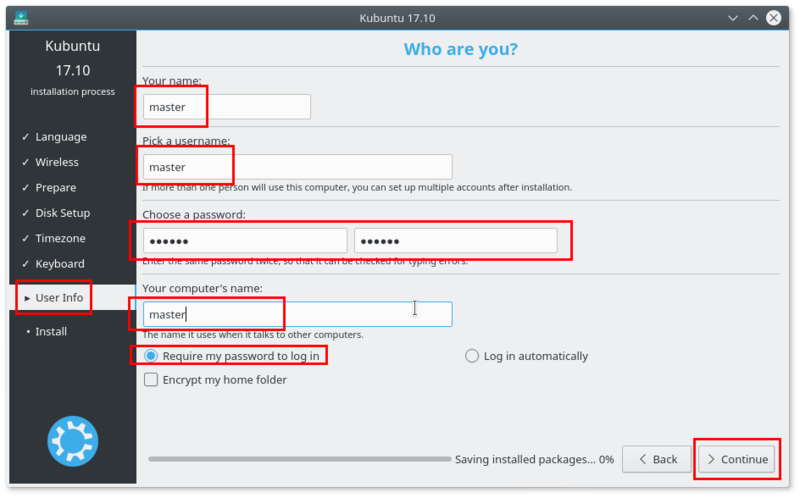 3) Username: determine your own username and its password for use in Kubuntu. Make sure you check "Require my password to log in" out. Tenth step: wait the installation process to finish. This should only takes about +/-20 minutes. 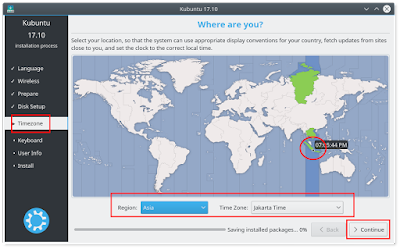 Once finished, Kubuntu informs you it's finished and you just need to click 'Restart Now'. Now you can log in to your system and enjoy Kubuntu 17.10!